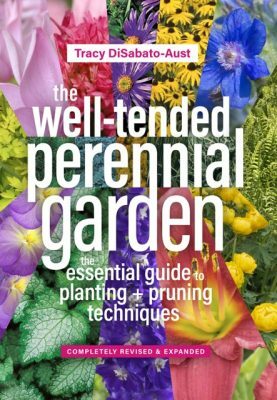 I was recently interviewed by Timber Press about the new and completely revised edition of The Well-Tended Perennial Garden. Visit the Timber Press blog for the full interview! 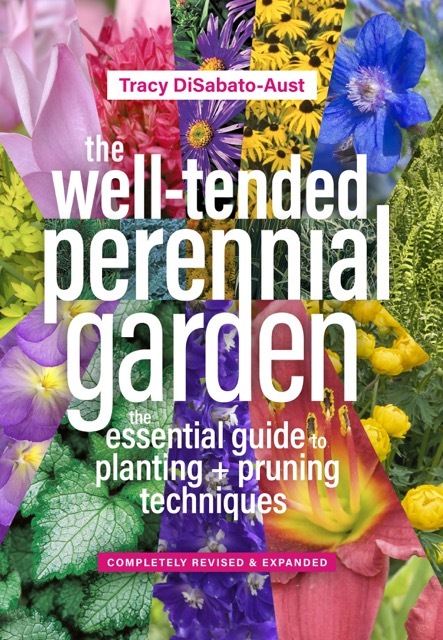 The Well-Tended Perennial Garden is one of the bestselling gardening books of all time. When you set out to write the first edition, did you have any idea the book would become as respected and widely used as it is? As it is said, “not in my wildest dreams” did I think the book would be so popular. I’m very grateful for the support of my readers over the years. Writing is a very isolated and exposing practice, especially as a younger woman in a male dominated field and as a first-time author. Fighting doubt and fear of failure was an ongoing process that eventually made me stronger and more confident. 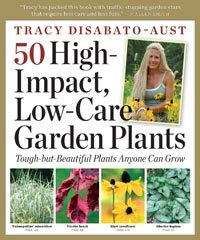 The new and completely revised edition includes new plants, new garden designs, up-to-date pruning and maintenance techniques, and a fresh new package featuring hundreds of lush photographs. Tell us more about the research you did to update the book. The updates are based, as Well-Tended has always been, on practical hands-on experience. It was fun to add the many new plants and cultivars that I’ve been growing and pruning since the first edition. Also, it’s exciting to share some of my new design projects and the lessons of sound horticultural practices for bed prep, planting, staking, division, and pest control they inspired. Read the rest of the interview here! or //www.timberpress.com/books/isbn.cfm/9780881928037/well_tended_perennial_garden/disabato-austclick here to purchase your copy of the new book! 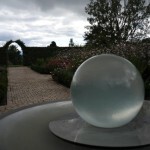 Comments Off on “The Well-Tended Perennial Garden”, now completely revised! 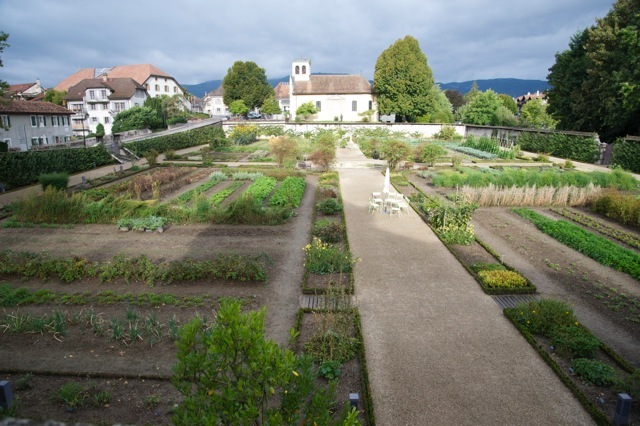 I had the wonderful opportunity in the autumn 2013 to speak on “The Well-Designed Mixed Garden” for the Swiss Association of Flower Arrangers at the Swiss National Museum in Prangins Switzerland just outside of Geneva. 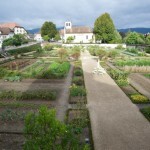 I did this interview with Hester Macdonald, World Radio Switzerland, in the gorgeous vegetable garden after the talk. 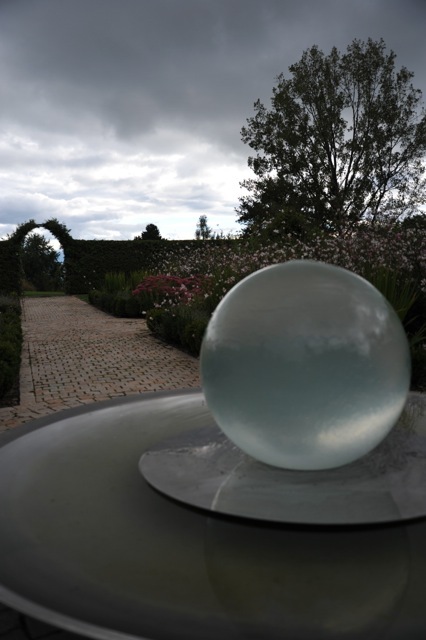 Included are a few photos from Caroline Sykes garden, my gracious hostess, for the event. Note the Swiss Alps as the “borrowed landscape”. During this same European trip my husband Jim and I raced Triathlon Worlds in London and visited The Royal Botanic Garden Kew. 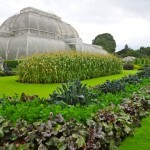 I had spoken at Kew many years ago and it was a delight to revisit and enjoy their “Incredible Edibles” display… yes, that’s sweet corn growing outside the Victorian Palm House!! Delighted as well they were carrying all three of my books in their gift shop!!! 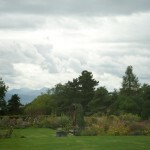 [Update: April 2011] In the spring of 2011, herbaceous plants were added to this garden. Here is a partial plant list and some updated images from the garden. Enjoy! 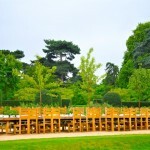 Provide strong structural outline – extending the walls of the house to the garden with either living or nonliving boundaries for privacy and intimacy. Utilize vertical space for vines and /or espalier. Trellis can be attached and a cutout or mirror(s) can hint at distant or not-so-distant spaces. Cooler colors make an area appear larger but may not be desirable in all seasons. 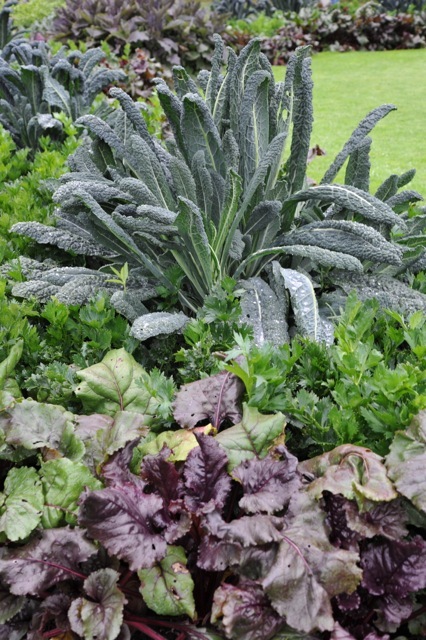 Planting smaller leaved plants in the background or finer textures increases the feeling of space. Change of levels and bricks placed on their narrow sides also create greater depth. OVERVIEW: Beautiful historic home built in 1895 in the charming German Village district of Columbus, Ohio. Client is an enthusiastic gardener but the overall design of the garden needed an update from the existing 20 year old plan. Key elements include: A keen sense of place. Heirloom, native, and fragrant, plants many which were available from local nurseries during the period in which the house was built. Mirrors placed in garage windows and gothic art piece reflect the space and increase its apparent size substantially. Custom made wooden window boxes scrolled with the same engraving that is above some of the windows on the home. Custom made trellis for utilization of the vertical space on the fence and for hiding the air conditioning units. Espalier fruit and ornament trees. Beautiful neat, and uniform, living walls for intimacy. Old Oak whisky barrel installed as rain barrel. 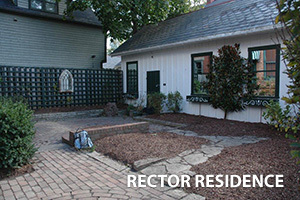 SITE EVALUATION: Small enclosed garden approximately 30’ x 25’ including a 14’ x 14’ brick patio in the center. English ivy had taken over the garden and had developed into a mature deeply rooted woody plant that required the entire season to eradicate before establishing the new garden. Most of the other existing plants were overgrown and dated. A soil test indicated 8% organic matter content – which is a good star – however the ph was high, even for this area, at 7.6. Beds were amended with 4” of a blend of different organic matter (See The Well-Tended Perennial Garden). Sun patterns performed by the client in the peak of the growing season revealed that most of the bed spaces receive only 1-4 hours of sun except for a couple raised beds near the house which receive about 7 hours of sun. 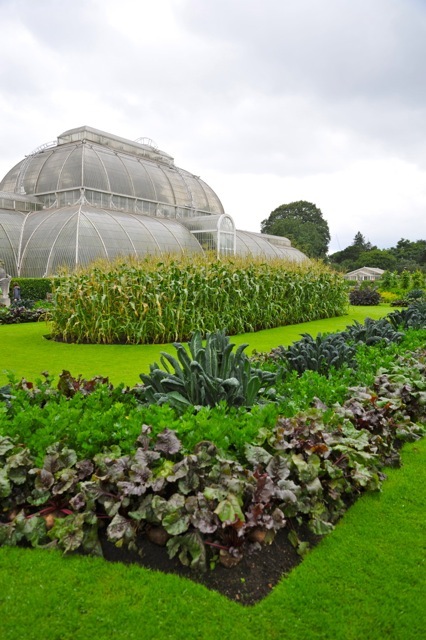 The garden is in a protected USDA hardiness Zone 5/6. One of the main challenges was installing the large plants and irrigation into such a small space. STYLE: The house and neighborhood dictate a European/German influenced historic style. German gardens are typically neat, and orderly with an emphasis on fruit and vegetable culture along with a love for flowers. Houses are frequently adorned with ornamentals and there is an interest in new plant material along with a high degree of craftsmanship in stone, wood, and iron. 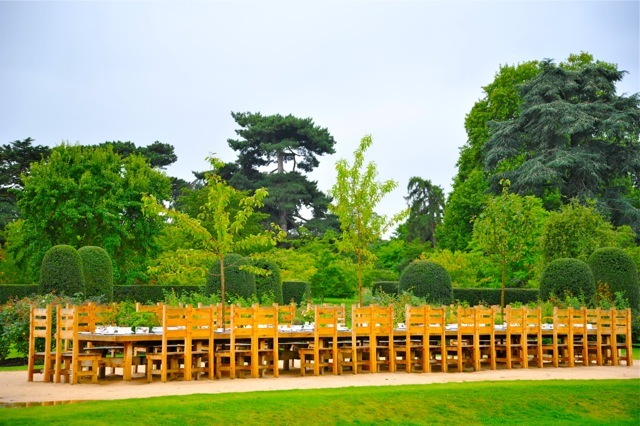 FUNCTION: Gardens are primarily for the personal enjoyment of the clients. However due to their highly visible location along a sidewalk leading to a large park they are viewed and enjoyed by many of the residents of the community. COLOR, TEXTURE & FORM: In the spring the colors will be cooler and softer including pinks and whites but the client’s passion for bright saturated hot reds and oranges will dictate the palette for summer and autumn. Variegated foliage and yellow foliage will also be part of the colorful picture. PEAK SEASON OF INTEREST: Spring, summer and autumn would be the seasons the garden would be enjoyed. PLANT SELECTION: Colleague and friend Denise Adams author of Restoring American Gardens (Timber Press) was contacted for suggestions on plants which would fit the period and location. She provided a plant list for the Columbus Nursery which was located three quarters of a mile south of town on High Street (German Village) and was established in 1855. I used the list to help drive the plant selection. 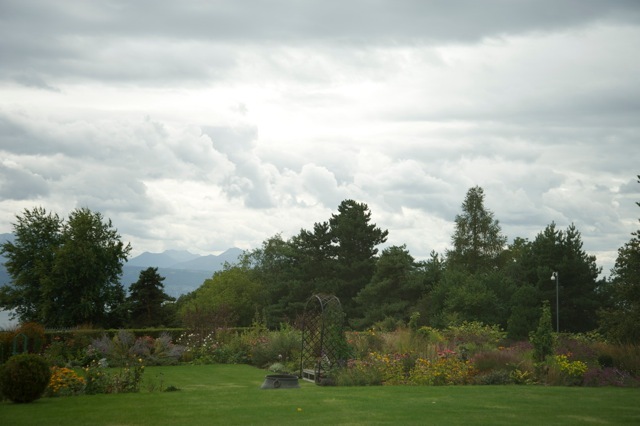 Native and fragrance were also part of the criteria for many of the plants. ENJOY THE GALLERY OF BEFORE, DURING, AND AFTER OF PHASE I OF THE INSTALLATION!! DESIGN BY DISABATO-AUST/INSTALLATION AND CONSTRUTION BY HIDDEN CREEK LANDSCAPING INC. PLEASE CONTACT US FOR DETAILS ABOUT OUR WORK. 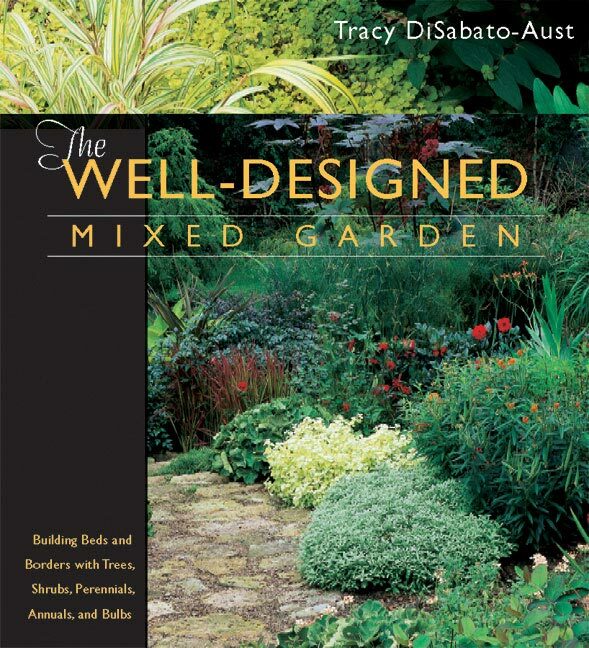 [email protected] For more design lessons from Tracy see: The Well-Designed Mixed Garden. I had the opportunity to have Joe Lamp’l aka Joe Gardener visit me in my gardens at Hiddenhaven and film a segment, on pruning perennials, for his new gardening series on PBS called “Growing A Greener World”. We had a blast and it was such an honor to spend time sharing my craft with such a knowledgeable fellow gardener. We hope you enjoy watching the video and reading Joe’s article. Check out his informative site at www.joegardener.com and be sure to watch “Growing A Greener World” which airs in every state on most PBS stations. The mission of the show is to travel the country, telling the story of how people, places and organizations are using the garden and eco-friendly practices to promote environmental stewardship and how viewers can apply these same principles to make a difference in their own little corner of the world. The program covers organic/sustainable gardening and also features a cooking segment each week with fresh in-season ingredients….Cool! Hi! 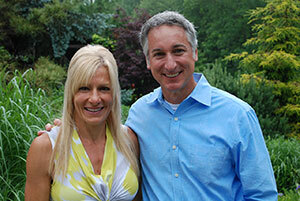 I just wanted to let you know the triathlon page on my website has been updated. Also, check out the article in this month’s Columbus Monthly – “Fitness Freaks At 50”. 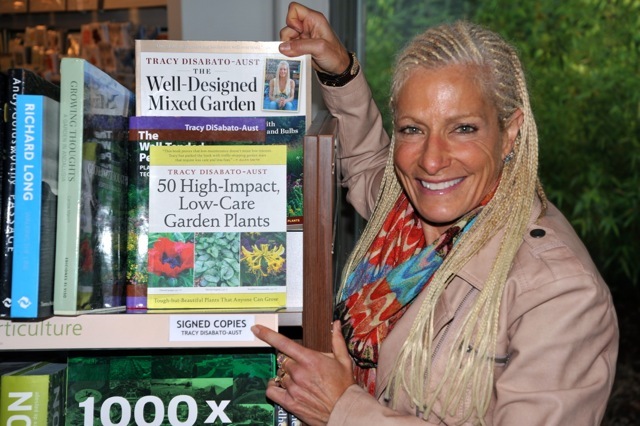 Come and join me at the The Central Ohio Home & Garden Show – Ohio Expo Center, this Saturday Feb. 27, 1pm & 3pm for Design and High-Impact, Low-Care Plant talks. 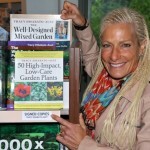 For more info and an article featuring “Tracy’s Trophy Plants” visit www.dispatchhomeandgarden.com page 34. Tracy provides solutions regarding pest problems, insects, identification of healthy and ailing plants, chemical pesticides, and critter control. Tracy’s back with more advice on: What is garden ‘staking’? | What is ‘pea staking’? 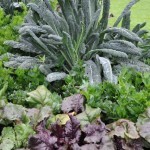 | When is the best time to stake my flowering plants? | What should I use to stake my plants? | How do I stake a plant with a single upright stem? | How do I stake full bushy plants? 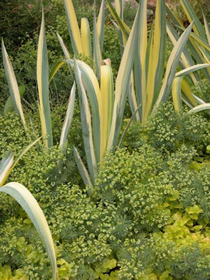 | How do I stake perennials that have fallen? In a well-designed border, we often notice the beauty of the combinations of plants more than the individual plants themselves. To achieve this sense of interplay, it’s useful to think about visual texture: the patterns created by the lines and forms of combined leaves, branches, and flowers. Instead of using threads or yarns to weave texture, gardeners can stitch together the varied patterns of plants to create living tapestries. This can be accomplished in a number of ways. Reprinted with permission from Fine Gardening Magazine. As plant nerds we all go through different plant fetishes. I’ve been through numerous “species obsessions” including the Geraniums, the lilies, and the Dianthus just to name a few. And currently I’m into Carex in a big way. But I’ve been in love with poppies (both annual and perennial) for about as long as I can remember. I even have a history of “smuggling” poppy seeds into the USA in my “unmentionables”J when returning from a year and a half of work/study abroad 28 years ago. The best germination success of annual species, for the home gardener in colder climates, seems to occur when the seeds are sown directly in February or March when the ground is free of snow. Also to ensure success I’ve learned to order fairly large quantities of seeds—one small packet just doesn’t cut it. I’m talking about getting ¼ lb. or even 1 lb. of seeds when available. I sow seeds of California poppy (Eschscholzia californica), Red Corn Poppy or Flanders Poppy (Papaver rhoeas), and Bread or Opium Poppy (Papaver somniferum) about the gardens in any available space. It is harder to find large quantities of opium poppy so it may require numerous smaller packets for best effect. A great source for seeds of poppies is Wildseed Farms www.wildseedfarms.com. Also remember to allow poppies to go to seed once you’ve got them established in the garden. You can even cut off the mature seed pods and spread them about in the desired location. Good luck with these gorgeous plants.